TurboPDF v2 is a major version which focuses on “Connected PDF” - the ability to manage, track, collaborate on and secure your documents through the Cloud. 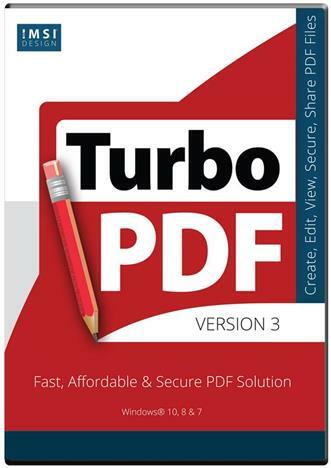 TurboPDF also has added a series of new capabilities, such as Action Wizard which saves keystrokes on oft-repeated processes, ability to convert Chrome and IE webpages to PDF, Dropbox integration, and has also enhanced the user experience for the existing features, as well as some bug fixes. Click the “New Features” tab for more details. The 3D Plug-in for TurboPDF expands the power of TurboPDF v2 with the ability to read .U3D, .DWG, and .DXF file formats so users can add 3D images and CAD files to their PDF documents as interactive 2D and 3D content. 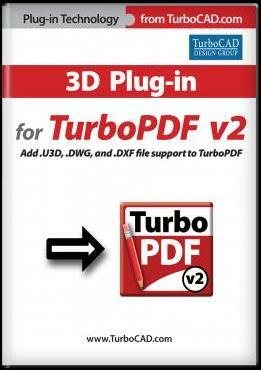 The 3D plug-in for TurboPDF is a valuable addition to TurboPDF v2. It gives TurboPDF v2 the power to read .U3D, .DWG, and .DXF files so that they can be added to PDF documents as interactive 2D and 3D content. Once in TurboPDF, users can easily document a design; add comments and details about the design like linear, angular, or radial measurements; add professional touches like a header, footer, background, or watermark; even secure with powerful encryption. With the 3D plug-in for TurboPDF v2, you will be able to import 3D PDF* files saved in the .U3D format. You can then view, edit, and markup the file as you would a standard PDF. This allows you to avoid converting back and forth between file formats to make edits. When .DWG or .DXF files are imported into TurboPDF, any layer information contained in the CAD drawing is preserved with the plug-in and can be displayed in TurboPDF. In addition to importing of .U3D, .DWG, and .DXF file formats, the 3D plug-in also gives TurboPDF the power to save in the .U3D file format. Recipients will be able to interactively view 3D models from within the PDF, readable on most operating systems and hardware devise, without additional software. And since many CAD applications like TurboCAD can also import .U3D files, you can ‘round-trip’ the annotated file back to your CAD or graphics program. * The 3D plug-in for TurboPDF reads and writes to .U3D files. It and does not work with .PRC files.